The annual meeting of the Association for the election of Board Members is held at the clubhouse on the first Thursday in May of each year, at 7:00 P.M. The Board of Directors of the Association consists of nine members, three of whom are elected each year for a three-year term. Elected members are then appointed to specific duties by the in-coming board. That is, a nominee does not run for a particular position such as President or Landscape Director, but runs as an “at-large” candidate. Directors may run for re-election every three years. There is no term limit rule. 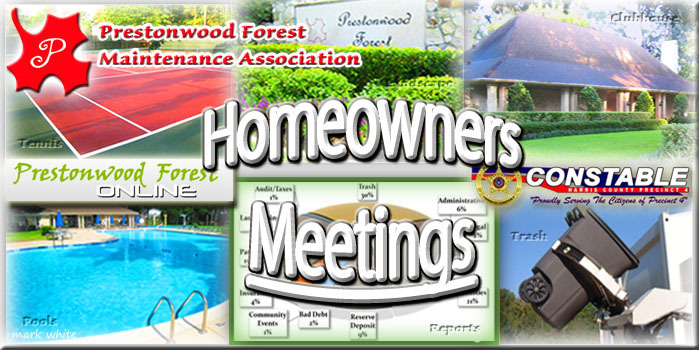 Formal notice of the annual meeting will be mailed to each homeowner of record well before the date set for the meeting, and proxy forms will be provided with the notice. Ballots for homeowners are provided at the meeting. An agenda will be prepared and may include items other than the election. For reference, a sample ‘Annual Meeting’ agenda is posted below.